Free for All Friday is our weekly open forum, but we usually try to kick things off with a question. There's no rule about that, but it's what we tend to do. 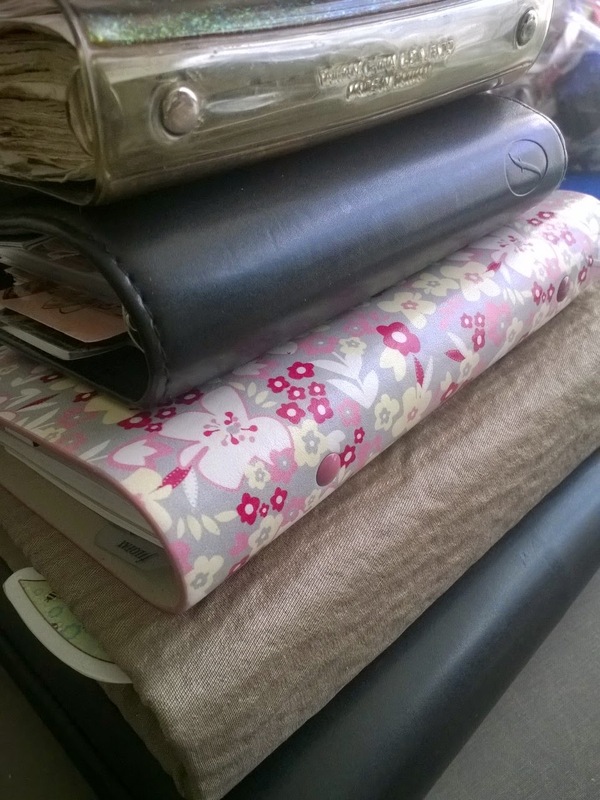 Do you have your own Filofax rules? 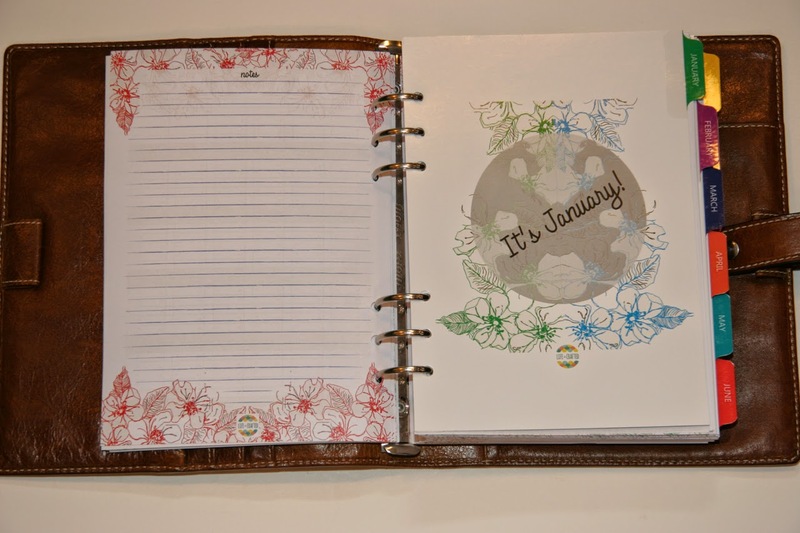 One of mine is, I can only make major changes to my system or format every six months—January and July, the months when new calendars usually begin. Do you keep a list of rules, or are they just unspoken? Thank you to Alison for her guest post. It was only in January of this year that my mind was woken up to the wonderful new world of Filofax by my fellow business networker and dear friend, Rita Sedani. Well I never! I had no idea that a friendly war was erupting all over the world as to who had the best binder, the prettiest decorated inserts, the latest accessories, and so on! What a hidden community of ‘owners’ I have been introduced to. All I need now is to discover that the Borrowers are living beneath my floorboards and then my life will be complete! I became an ‘owner’ in 1983 when I was 16. 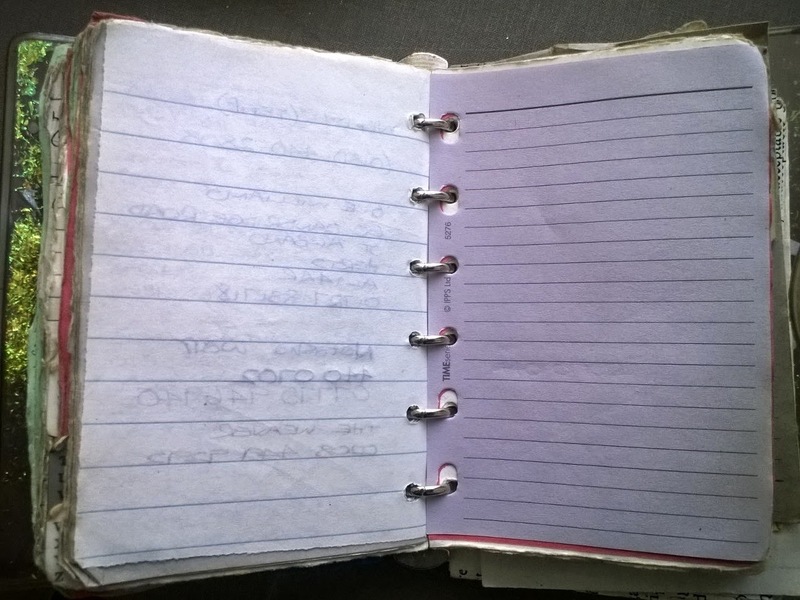 Back then, I didn’t know there were ‘names’ to the size or style range, but let’s say my first Filofax was a ‘pocket’. It was maroon (which I hated as it was the colour of my school uniform) with a pinkish floral fabric cover, which soon became grubby, but hey, it was a birthday present, so I wasn’t going to sniff at it. I used it as an address book and calendar. I kept this until last year (I still have the inserts), and it is now somewhere in recycling heaven. I used this pocket one for quite a few years before I replaced it with another ‘pocket’. By this time it was 1997. Believe me, this new one was dead funky – oh yes, I was definitely the cat’s whiskers owning this little beauty. 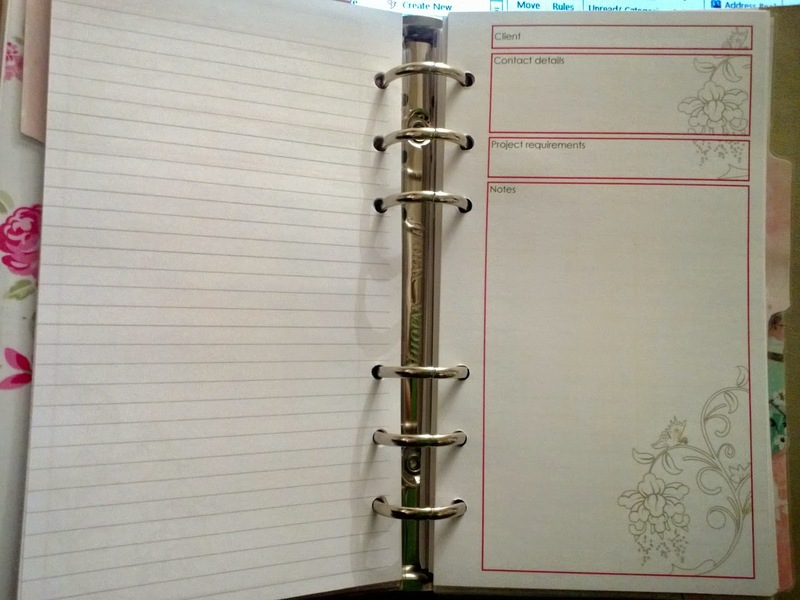 It wasn’t made by Filofax, but it had the same mechanism, the inserts from the old binder fitted, and so on. 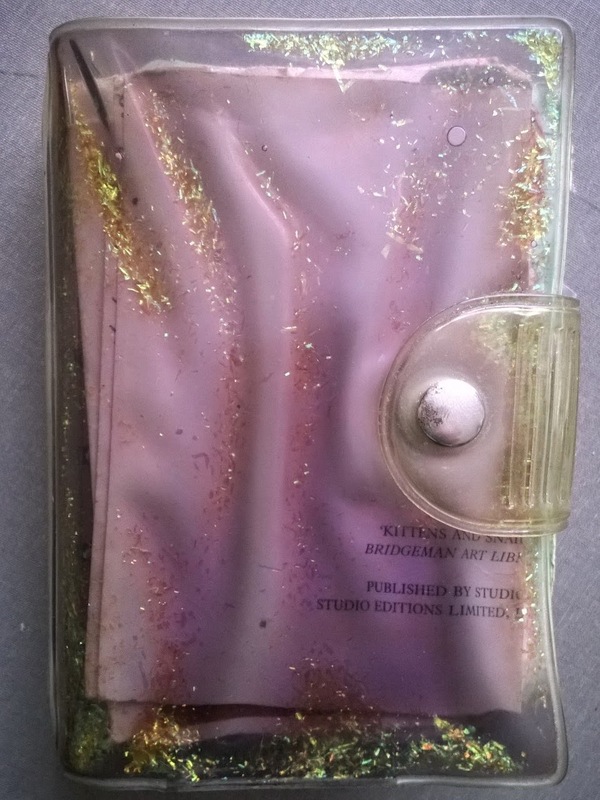 It had a transparent cover which was filled with purple liquid gel and that contained glitter. On reflection, it was a Del Boy mode of transport. 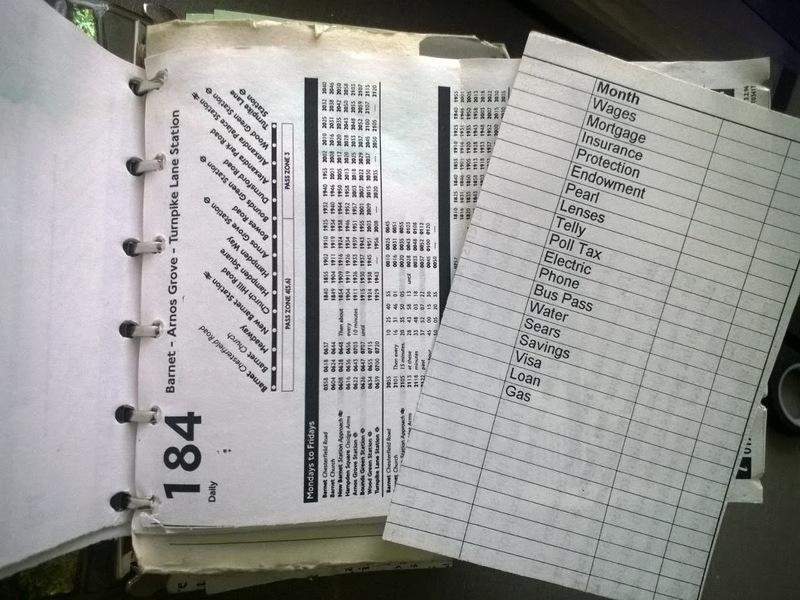 Way back then I was making my own inserts, just cut down pieces of lined paper and print outs for monthly financial tracking - unbeknown it would become such a big industry in which I would eventually take part. Using a photocopier, I used to shrink down inserts to fit this binder, for example my local bus timetable. 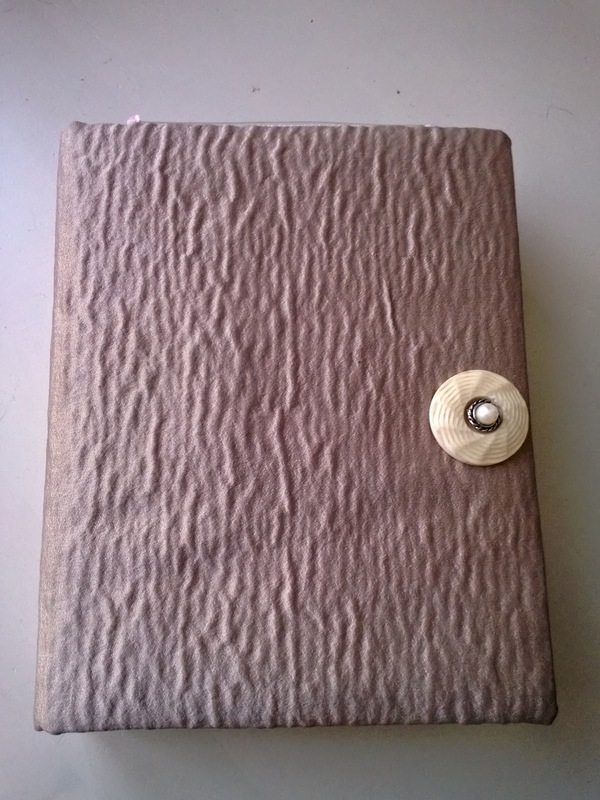 The binder has since developed a stench similar to candle wax, where the back cover has burst and the gel has leaked onto the pages. Although the cover didn’t last, the ring mechanism are still working. 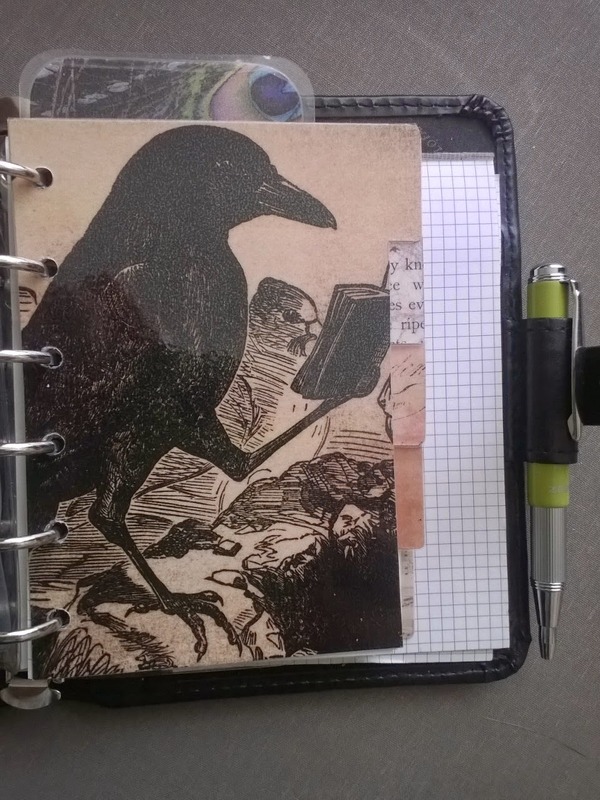 I must have been leaving myself breadcrumbs because I replaced the gel binder for a black pocket Metropol Filofax, still unaware of any phenomenon surrounding Filofax. I am still using the Metropol (as a shopper) – I take it everywhere with me and it contains information such as presents I have bought my family; things I would like to buy my family; measurements of rooms, windows and furniture; an inventory of my Denby collection; loyalty cards and coupons; supplier/stockist information; it even references the colour of my hair dye. It’s in immaculate condition. After the world had overcome the panic of the 1999-2000 computer date issue, I went up a size to a burgundy leather personal (yes, I had gotten over the school uniform colour by then). I used it solely for work appointments. A few years later, I ditched a paper diary in favour of a mobile phone, as the company I worked for required us to sync our calendars to the file server. It was a sad time, as I dearly love hand writing. I was made redundant in 2010 and immediately started self-employment as a crafts person, making wedding invitations and general paper craft items. I had lots of bespoke orders and therefore needed to take lots of client notes. I could write up to 20 pages of notes depending on the client project. 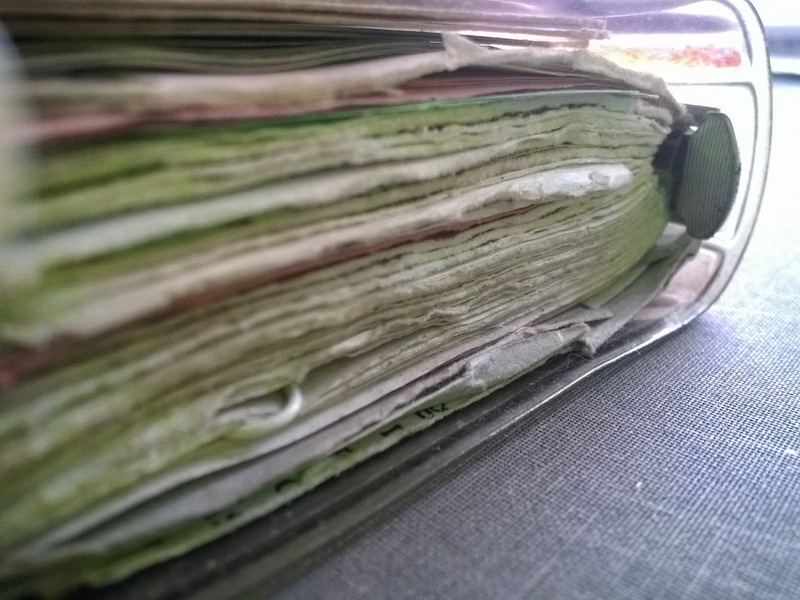 For this amount of writing, I used A5 notebooks – and then I used to scan the pages and upload them to my computer and store the notes in electronic client files. For me, the drawback to using bound notebooks is that once you turn the page, you have lost your ‘call to action’ without using visual reminders, such as sticky tabs, which I sometimes find irritating and untidy. So, I decided to go back to a loose leaf binder in which I could easily sort and prioritise pages and shift around the running order. 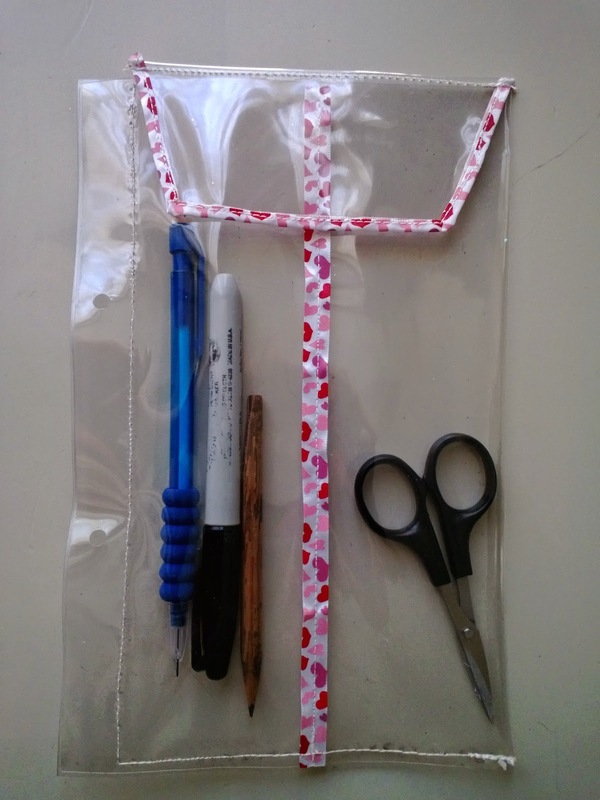 I cut down an A4 ring binder into A5 size and covered it in fabric and made my own inserts, such as a pencil case from an old piece of plastic sheet, dividers from old birthday cards, etc. I hear you all laughing again at my naivety! Again, I had no idea that such products for Filofaxes were available to buy anywhere. At this stage I was still using a mobile phone for diary appointments. 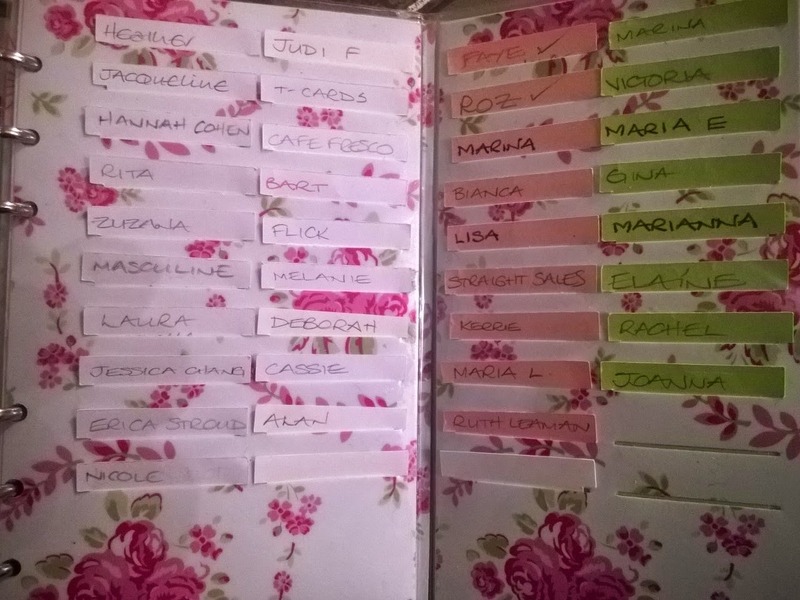 I met up with Rita again and she added me to some Filofax/planner related Facebook groups. 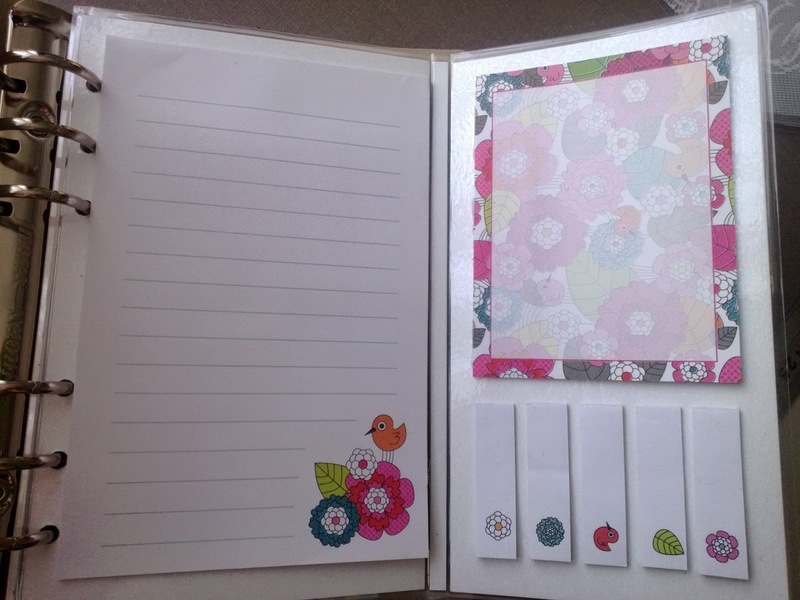 She also very kindly gifted me a Blossom Personal Filofax, which I absolutely adore, and for which I made bespoke inserts especially for my craft business. 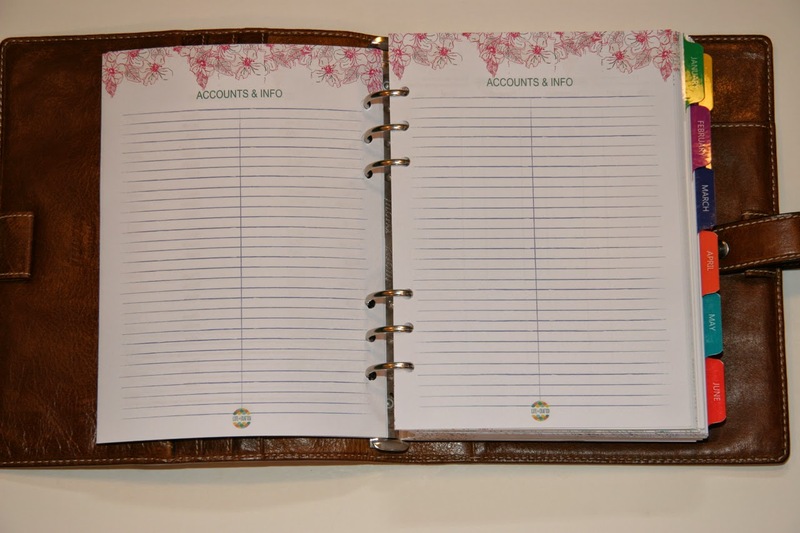 I made client order pages, perforated shopping lists, a stationery dashboard and project tracking mini t-card system – and I am making similar products for other Filofax users. I’m still not using a paper diary or any of the Filofax original inserts. 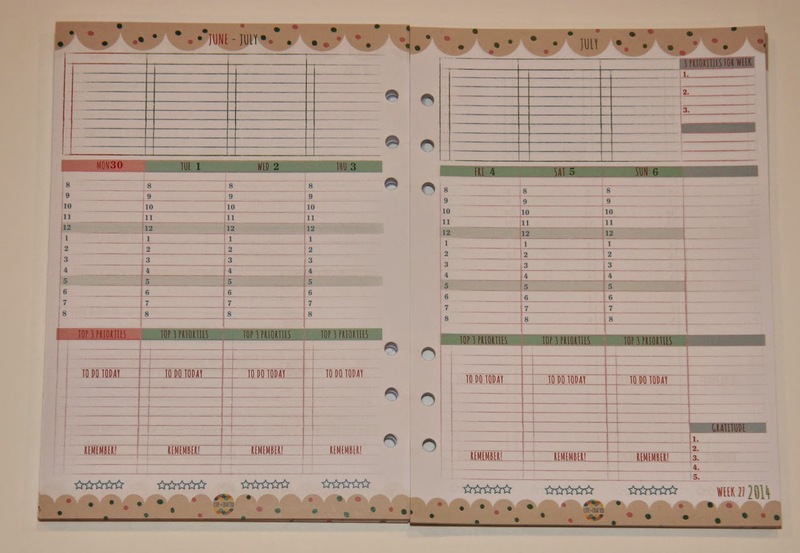 So, although I don’t necessarily need these particular original inserts to organise my life, I do need a Filofax with a bespoke set up, all of which is inspired by the Filofax range of products. Rita has also gifted me with an A5 black zip around Filofax, which I haven’t yet set up. So, I am the owner of a leaky gel pocket and an A5 customised ring binder - and the very proud owner of 3 official Filofaxes. 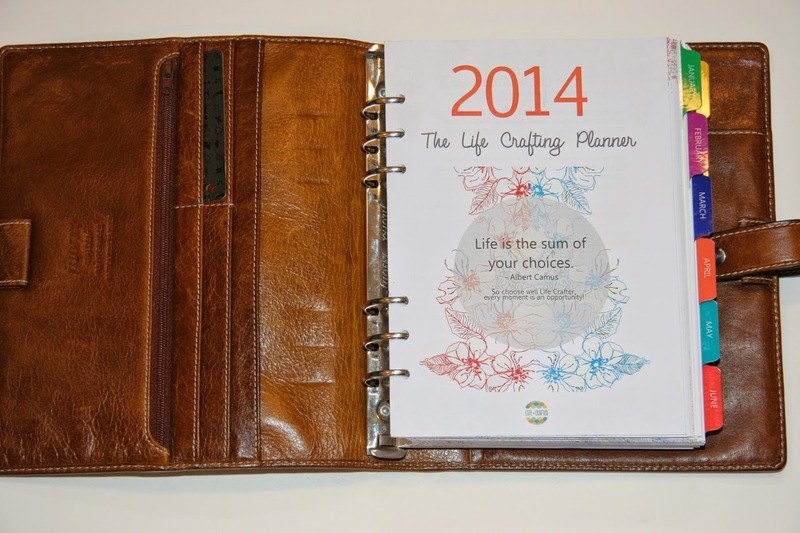 Life Is Crafted, is the enterprise started by Arienne Gorlach back in 2012. It has made quite a name for itself with a wide range of inserts being made available to buy in PDF (Print Yourself) or in pre-printed formats. 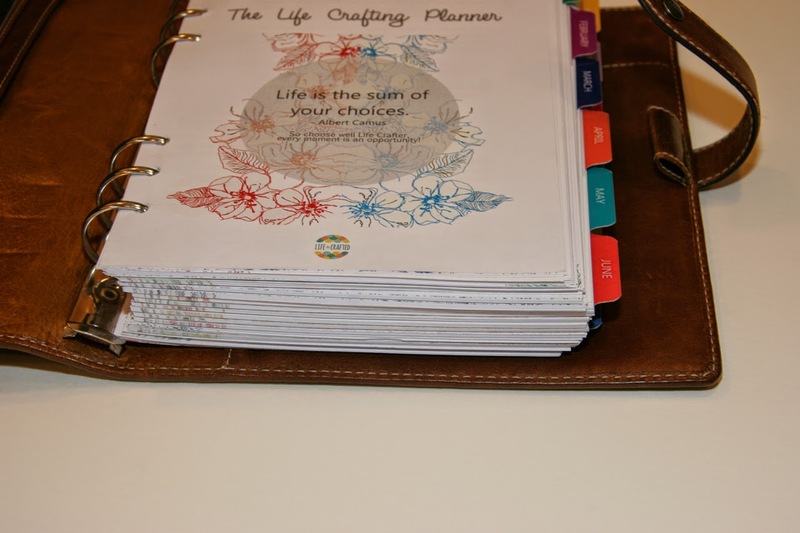 Looking through the Life Is Crafted website I get the impression that Arienne and I both suffered in a similar way for a long time... constantly looking for that perfect planner insert that suited our needs but couldn't buy it, so we made our own. We aim to give you the inspiration to dream, plan and schedule the life you want so you can LIVE IT OUT! 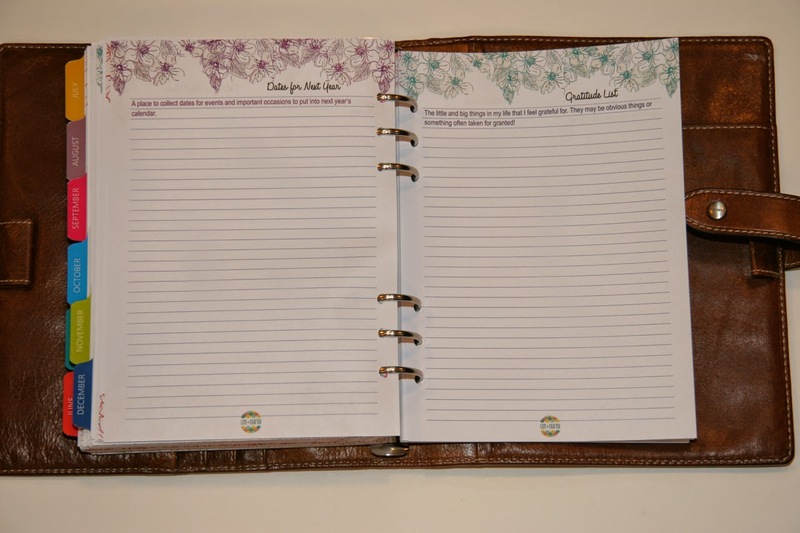 I'm sure you will agree after you have seen the planner pages that you will be able to do all of these things! Recently Arienne contacted me and offered to send me a set of her inserts to use, naturally I'm always interested to see how different inserts are designed/produced. 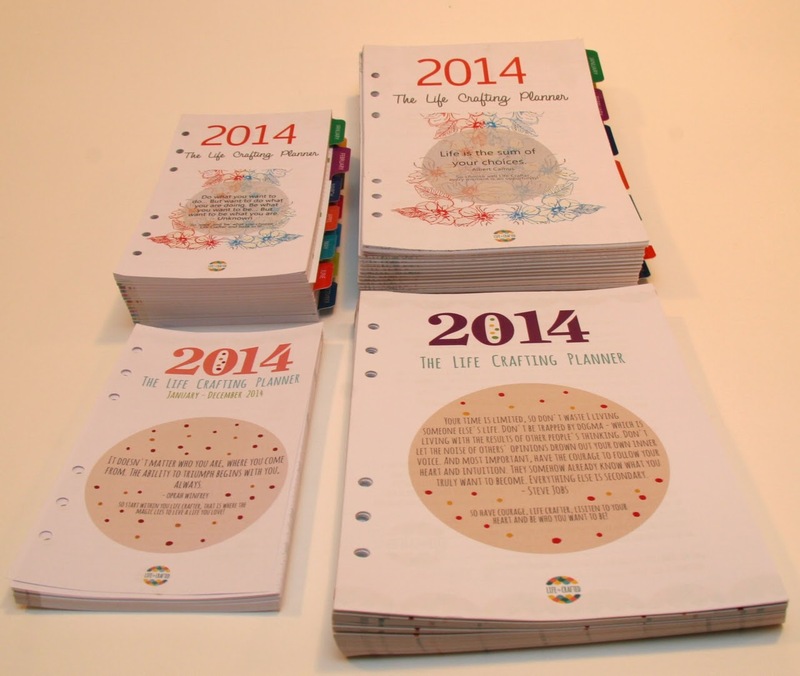 I was a bit surprised when a large package arrived in the mail this week with four versions of the Life Is Crafted 2014 inserts in day per page and week per view formats in both A5 and Personal size! These are the two sizes available from Life is Crafted. They are available as PDF's that you print yourself, or as printed pages. The pages are printed on high quality 80 gsm weight paper. I'm going to take you through the A5 size inserts and compare the Day Per Page and Week Per View (Week on Two Pages) formats. The first thing you will notice is that the day per page insert is quite a huge stack of paper compared to the week on two pages inserts. 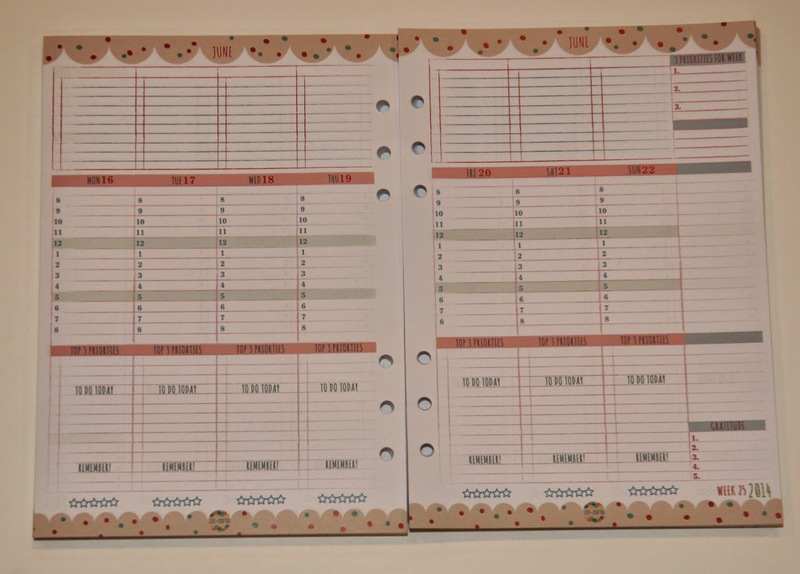 Fortunately it has been designed with being able to separate the months out and there are month tabs. So just loading say three or four months should make it more manageable. But I had to try it in my 30mm size Malden... it just about fits... but not comfortably... 'so don't try this at home!' 6 months worth should be more than enough I would think for most people. Then as you complete a month load another month so may be keep the last 2 months, and the next 3 or 4 months live in your organiser. So we start with the introduction page on the Day per Page insert. 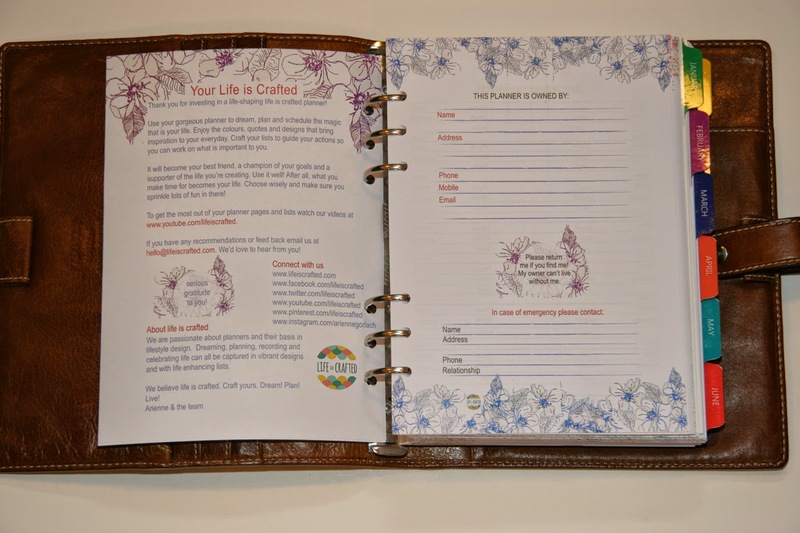 The reverse side is packed with information about how to get the most out of the Life is Crafted planner and how to connect with the team at Life is Crafted. There is then the 'owner' page. 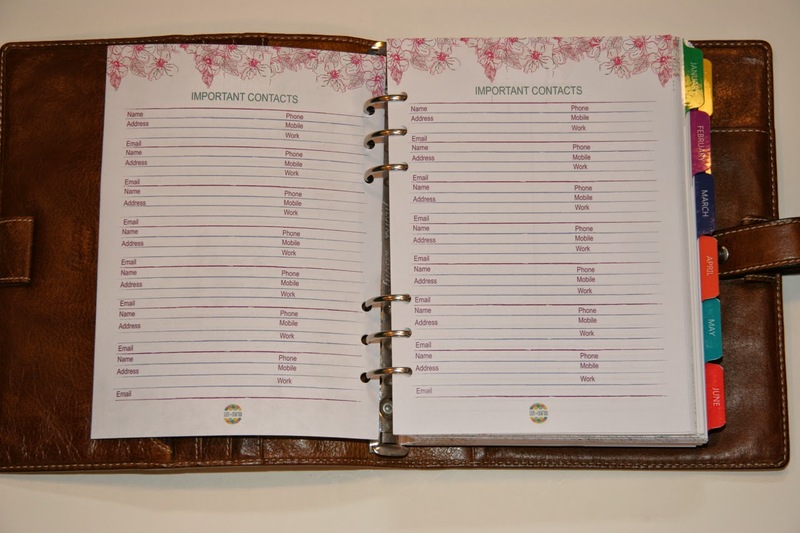 We then have 'Important contacts', being at the front of your planner these will always be easy to find. Similarly, accounts and information. This could be utilities and suppliers information, again things you might need in a hurry. Password reminders, with important tips as well you will notice. The tips are an integral thing of the design of these inserts and you will see them on most pages as we run through them. Part of the whole philosophy behind the Life is Crafted Planner is to make you think about your path in life, and this is where you get started on that path with a summary of your goals and your intentions for the year. Then a description of your 'Ideal Day' as you can see... mine is very empty! A set of Master To-Do Lists, which offer short and long description boxes is a useful feature. You can divide these up as you wish. Personal, Family, Work etc. or any way you would like. Goal planning is then very neatly broken down and presented in a way to help you set yourself some meaningful goals and to guide you through the process and meet your goals. Projects can be a variety of things from re-landscaping your garden to emigrating to a different country, big or small it helps to break these large or small projects down in to series of tasks. We all have routine repeating tasks we do each week or month. So record those here. 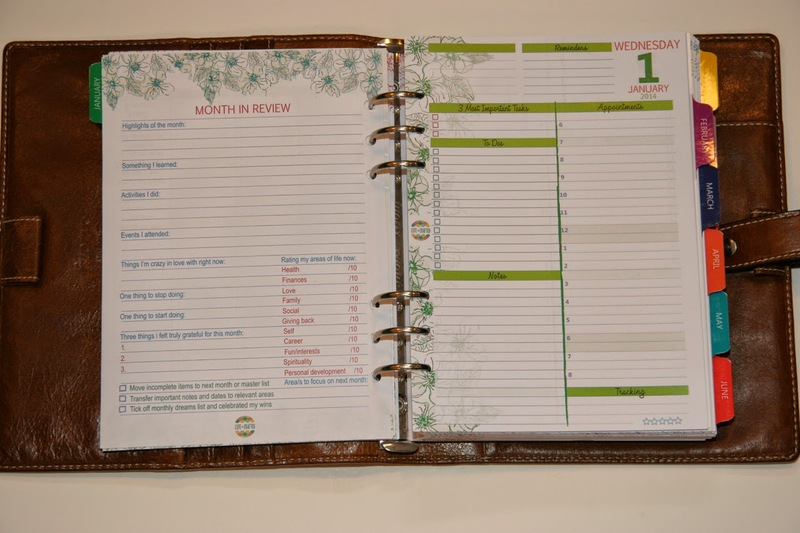 This helps you see where your time is being spent and how you can squeeze more in to any day. Special dates, is your master list of birthdays each year, fill it out once, up date it periodically and you are set for each year. Plenty of space for each day to have something recorded in it. February even has 29 days in it, so you can use this for leap years as well as ordinary years. 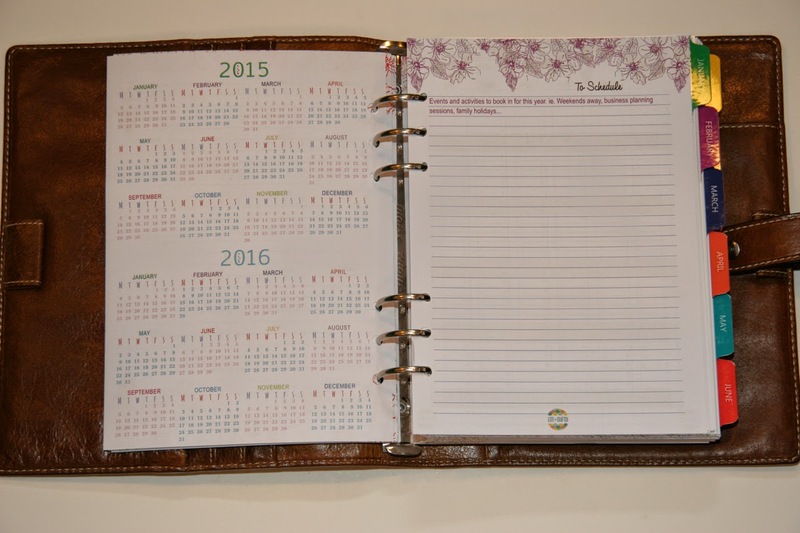 The calendar page has 2013 and 2014 on the reverse side of 2015 and 2016, so you can do some long term planning easily. The facing page has space to record those events and appointments beyond this year. 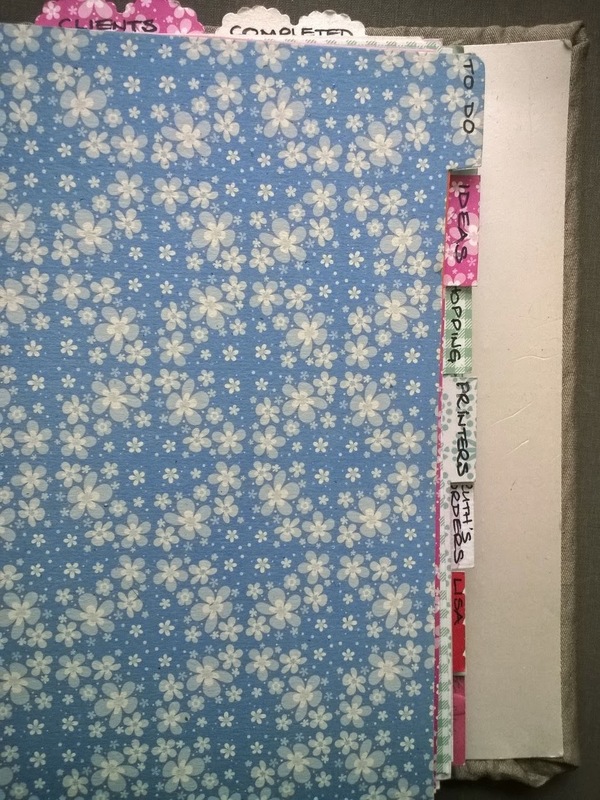 And then we start with a month divider, these are made from quite thick card with plastic tabs There is a strip of plastic reenforcing plastic on the reverse side too so they will last you many years. Each month starts with setting your goals and important things for the month, and some reminders at the foot of the page too. 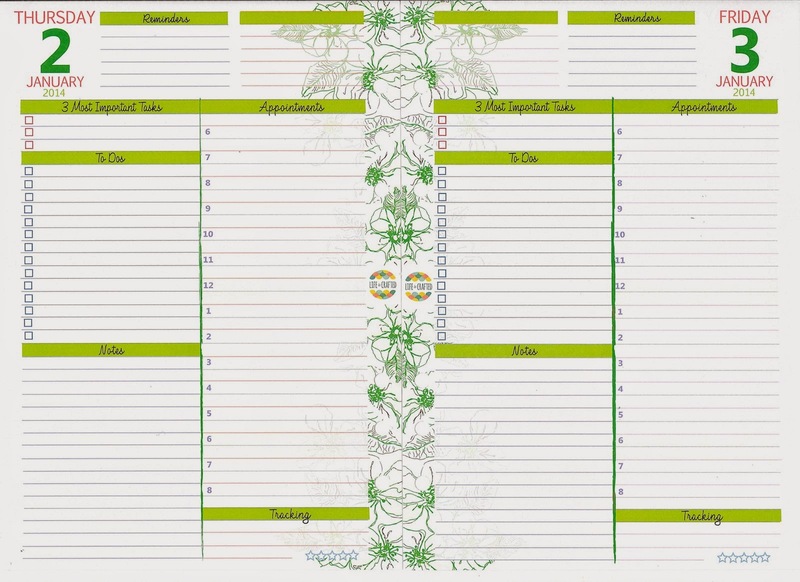 Then there is a month on two page calendar to give you an overview of the month. And then a monthly review sheet to complete at the end of the month. 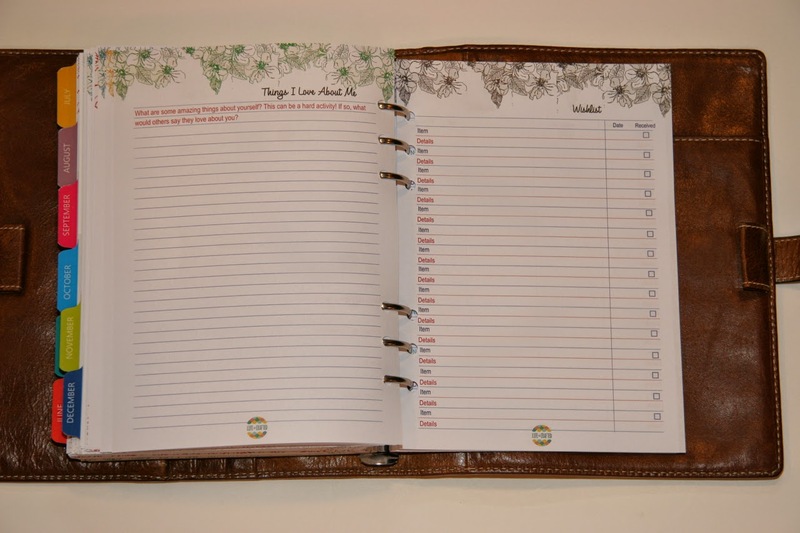 And here we are at the day per page diary pages. As you can see the day and date is nice and clear in the corners. The appointment span and space should be big enough and wide enough in range for most people I would think. There are then spaces for notes and to-do's for each day remember. Reminders sit at the top of the page, so birthdays and other important things can go in there. Tracking could be used for heath information or progress on projects etc. 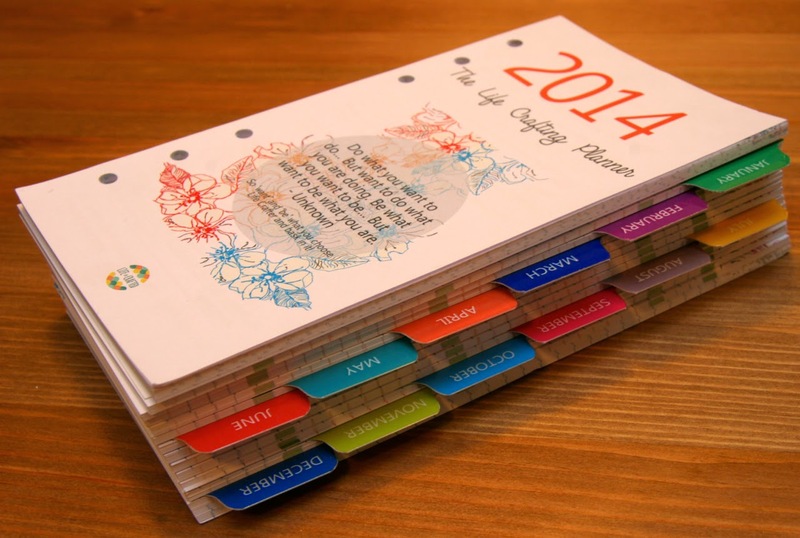 Thirty one day months are padded with a notes page to end on an even numbered page. This ensures that you can file away past months easily. Then after December 31, there is a Dates for Next Year section. Followed by a Gratitude List, I know I have a tendency to forget things like this in the context of when it happened. So collecting them together like this is a bonus and helps your memory. Life's highlights and Life Lessons, will help you form your life in a better way and set better goals in the future. I did it!! All about stuff you accomplished no matter how big or small! As well as people and things that help you on the not so good days. We then come to a series of lists with tips on how to fill these in on each one. Listing your friends as well, honest I do have friends... I didn't get to list them!! Yes.... we got to the end of this thirty something millimetre pile of paper! I didn't photograph all of the pages as you can see, I figured your scrolling finger needed a rest! Now turning to the Week on Two page version. The design of the pages is similar I've not tracked every single difference. 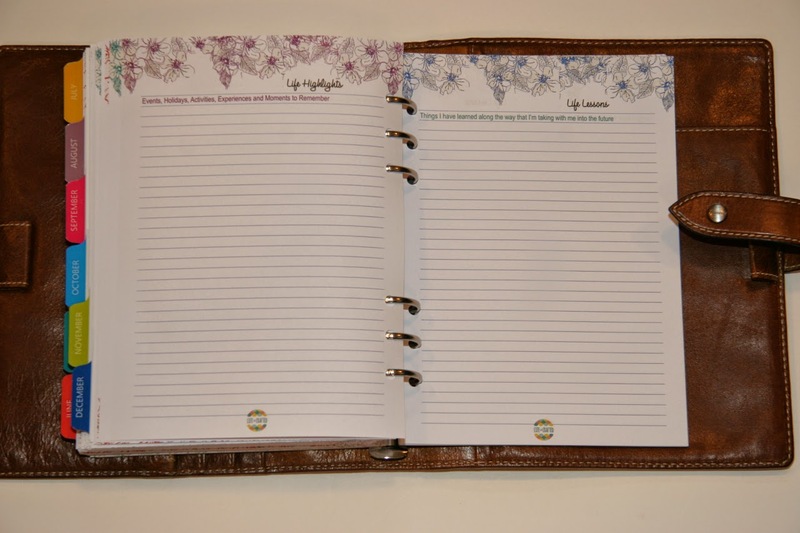 But the main difference of course is the actual diary insert pages themselves. And here is a double page spread in the middle of a typical month. So as you can see each day gets its own column, this is divided up in to a blank check list at the top, then the appointment area, then priorities and to-do's and remember at the foot of the page. 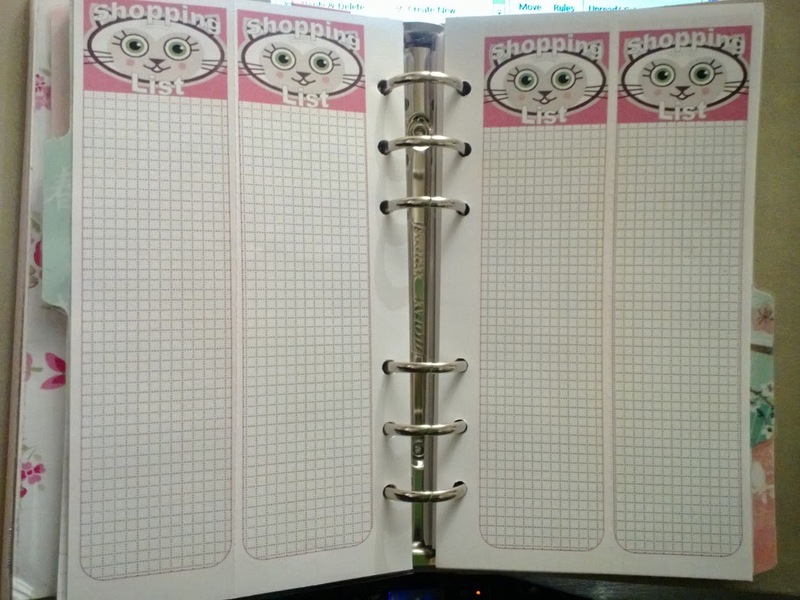 The very right hand column balances the page layout with priorities for the week, a blank notes area and 'gratitude' at the bottom right hand corner of the page. I like it that each day gets equal space. I'm not so sure that the rest of the space on this A5 insert has been used as efficiently as it could be. 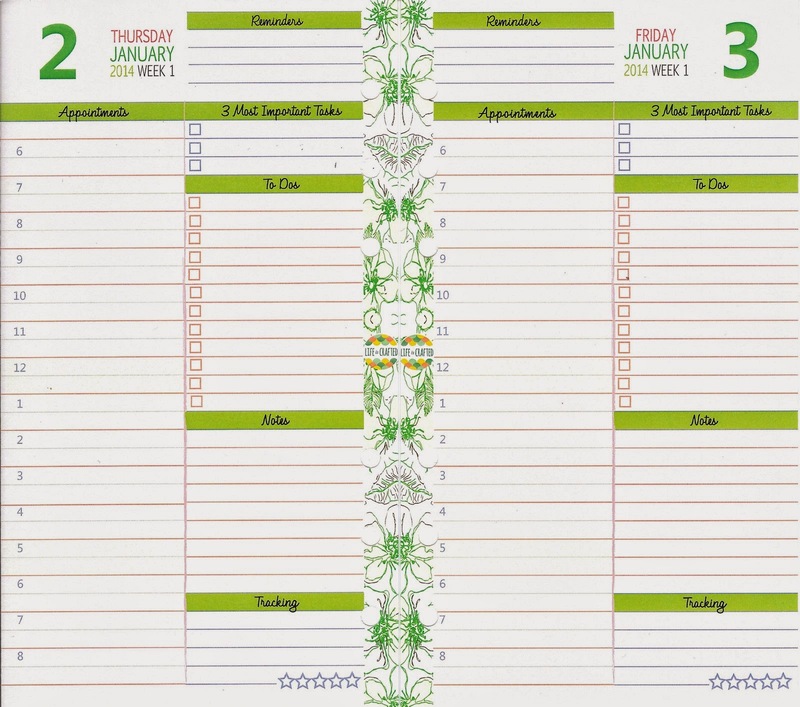 This will of course how your typical days split between tasks and appointments. 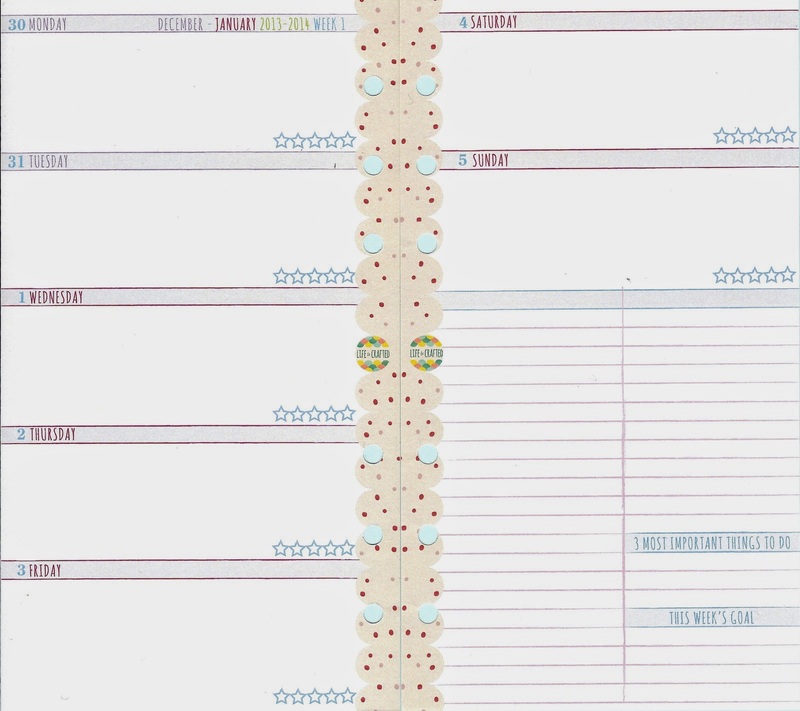 I'm sure some people might need more room for appointments than this design allows for as it is currently laid out. When a month changes at some point in the week, the diary insert doesn't allow for this, it just continues to flow from one month to the next as shown here between June and July. Despite this though there are still monthly calendars and monthly 'dreams' and review pages included; they just don't appear quite where you expect them to appear. 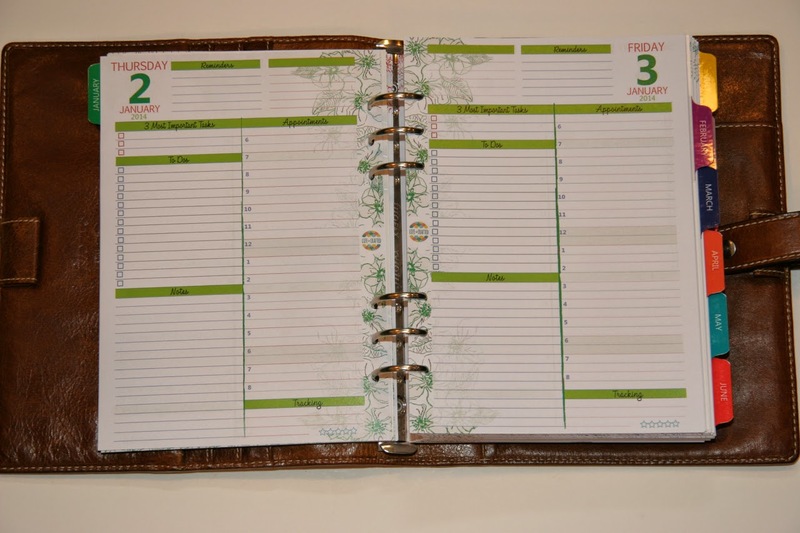 In this example below (July) we have the last day of June separated by six other pages from the rest of the month. There is however a huge size difference between these two in A5 size the day per page including dividers measures in at 32 mm thick, the week on two pages a much reduced 18mm thick including the same monthly dividers. As I indicated earlier it isn't intended that you hold a full 12 months of the day per page inserts in your A5 organiser, and nothing except a 35 mm Van der Spek will get close to holding all of the pages and dividers... that is if you are happy to carry around 815 grams of paper plus the weight of the organiser! Mind you the week on 2 pages tips the scales at 500 grams. These inserts are not printed on light weight thin paper... so fountain pen and other 'wet' pens shouldn't be too much of an issue here! 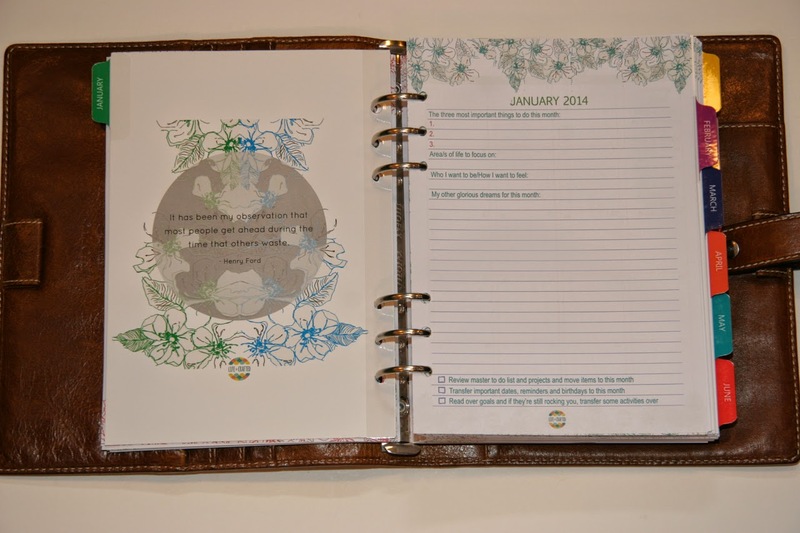 If you want something lighter, how about the personal size day per page... only 450 grams! for the stack of pages that is 34 mm thick, including the monthly dividers!! So moving on to the personal size in both formats. The first thing I noticed is that the personal size isn't just a rescaled version of the A5, the proportions are totally different. The designer has taken the trouble to design the inserts around the proportions of the personal size page format, but to keep the same layouts were possible, but adjust them to suit the smaller page size. For instance the year planner on the A5 is a double page spread with six months on each page. 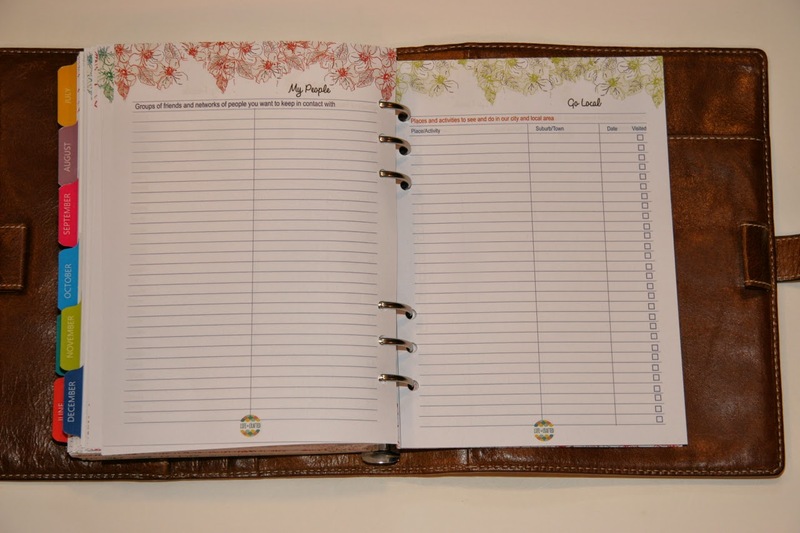 The personal size year is spread over 4 pages with 3 months on each page. It is attention to details like this that convinced me that a lot of thought has gone in to the design of these inserts, making the most of the different page sizes and proportions. Notice how the 'tracking' area is shifted across to be under the other task areas. This allows the appointment boxes to be a reasonable size and not be too cramped to write in. For some reason the order of the columns is different too, although I can't see any disadvantage or advantage for either really. The layout of the day and date also allows the better use of the smaller page too. It is only when you look at the two side by side you notice these little changes. The personal size week on two pages goes for a totally different layout compared to its A5 big brother. Again one month flows in to the next, but I actually think this is a better layout compared to the A5 one. As you can see the design is so much simpler than the A5 version and I think the personal size layout would work much better in actual daily/weekly use. When comparing the two I can see why this is my least favoured of the four designs. For me it is just too busy! I like the simple well structured layout of the personal size week on two pages of these two. 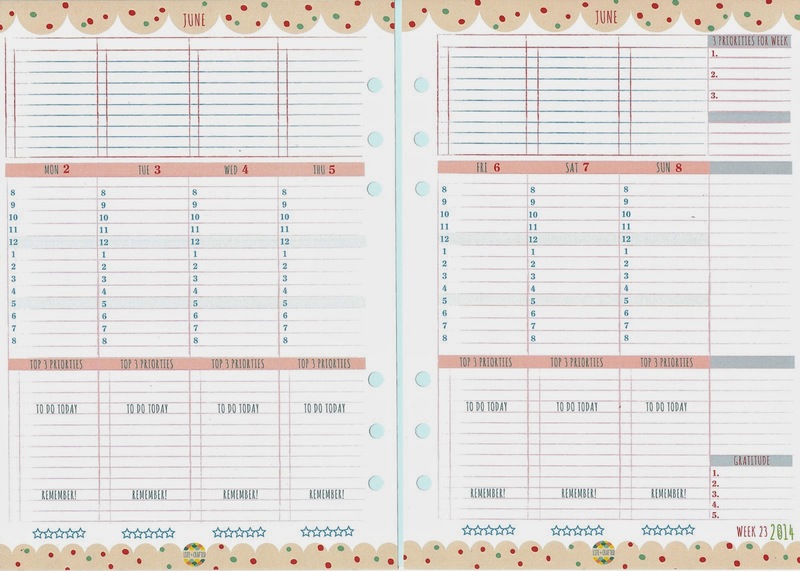 As with all diary inserts you have to make the decision as to what size you are going to use, then decide what format to use. Sometimes it's possible to mix formats. Some formats adapt better than others to this. Before deciding which size or format to use, you should try out a size and approximate layout for a couple of weeks on ordinary paper. This applies to any brand/type of diary insert not just the Life is Crafted ones. You will then have a better idea of which one is best fit for your needs. If you choose to go the Life is Crafted route, I think you will be making a good choice, there is lots of help already built in to the inserts in the way of hints and tips. Arienne herself has got lots of tips on her website too to help you make best use of the inserts. She's a great 'life coach' as well. I don't have a recommendation as to which size/format you should choose, my requirements will not be the same as yours... you need a size and format that meets your needs. And this range of inserts has different styles I think to match most peoples needs in one way or another. Thank you to Arienne for the samples. Be sure to visit her website at Life is Crafted. Guest Posting on Philofaxy, it is quite easy.